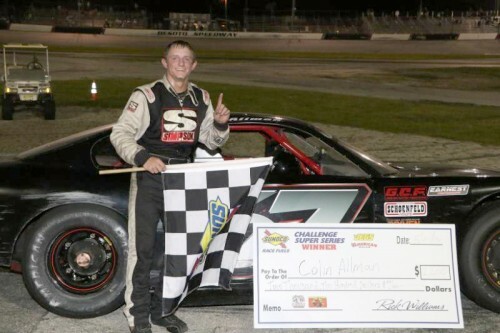 By Scott Lockwood, Desoto Speedway – When Colin Allman spun into the infield just a few laps into Saturday night’s 100-lap Sunoco Challenge Super Series Late Model feature event at Desoto Speedway, he figured his chances of a decent finish went up in smoke. 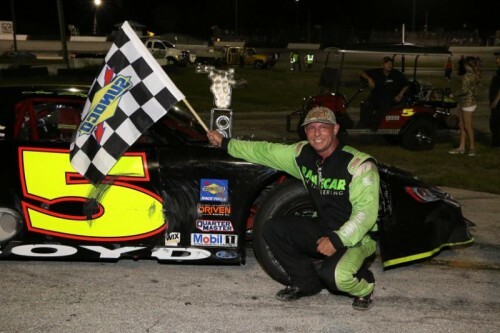 But when the smoke and carnage ended, it was Allman who was left holding the trophy in victory lane after beating several of the state’s top drivers in his first-ever win in a Super Late Model – part of a night that saw all sorts of madness under a full moon in eastern Manatee County. Polesitter Joe Boyd and third place starter Michael Atwell got the jump on Tyler Scofield and Jesse Dutilly on the start. The pair needed just a handful of laps to build a sizable lead, which was erased with Allman’s spin on lap 9. Dylan Bigley went from fourth to second on the restart. Dutilly eventually got by Atwell for third, quickly ran down Bigley and was battling for the runner-up spot when he got loose and spun coming out of turn two on the 28th lap. As Boyd controlled the race, all eyes were on Dutilly to see if he could drive his way through the field. After battling Nick Neri for several laps, he got to sixth at the halfway point, was fourth eight laps later and caught the Atwell/Bigley battle for second on lap 70. Dutilly dispatched Atwell for third as the field completed the 73rd lap and would stage a side-by-side battle with Bigley for second. Bigley was just ahead of Dutilly when the yellow flag came out for John Coffman’s spin with 20 laps to go. Dutilly got by Bigley with 16 laps left and was on Boyd’s rear bumper within three laps. The pair raced nose-to-tail for several laps, with Boyd thwarting Dutilly’s efforts on the outside. Dutilly was trying a cross-over attempt on Boyd when the caution flew with seven laps to go. On what appeared to be the final restart, Dutilly got the jump on Boyd and crossed the start/finish line before the rest of the field. Dutilly was sent to the rear of the field for jumping the start, ending his hopes of back-to-back Desoto victories. Boyd spun his tires on the restart, allowing Atwell to grab the lead with six laps to go. A lap later, Boyd and Atwell got together coming out of turn four. Atwell spun into the infield, and both were sent to the rear of the field. 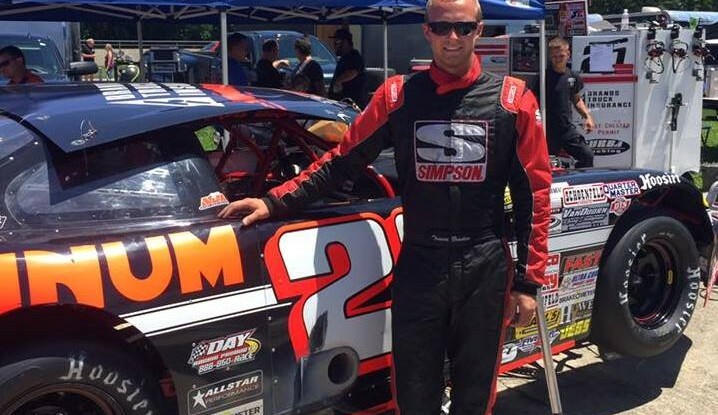 The incident put Allman, who started on the outside pole, in the lead. The young driver withstood a pair of restarts and held on for the victory. Bigley finished second, with Shane Sawyer, Boyd and Dutilly rounding out the top five. 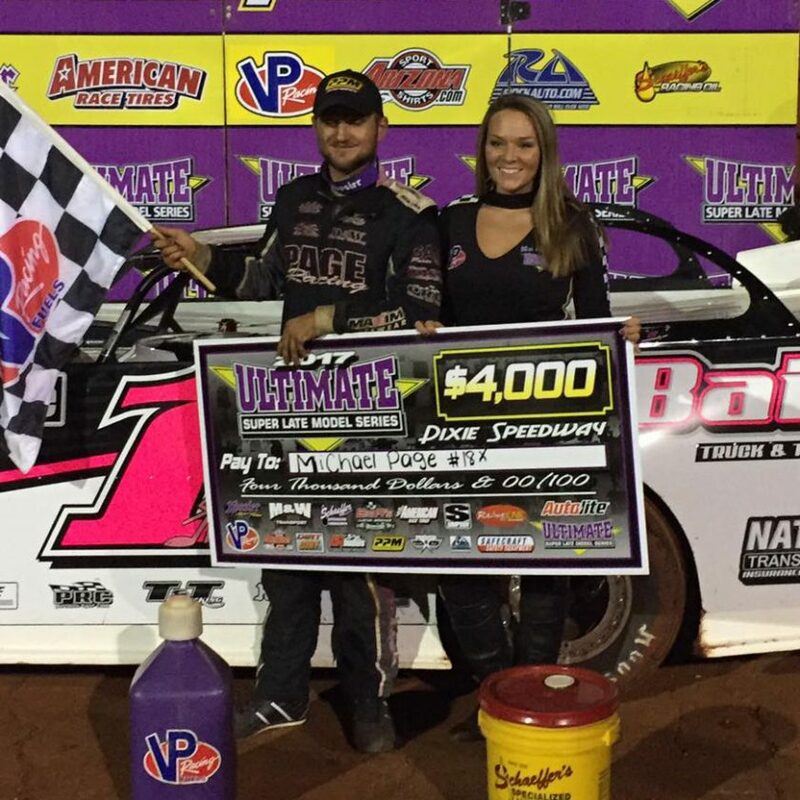 Boyd claimed the Desoto Triple Crown for the Late Models that went back to last season. He received a ring from Martin’s Jewlers along with a custom trophy for his efforts. course of the next 40 laps. As Kelly fought a loose race truck to stay in the lead, Bigley and Cruse staged a side-by-side battle for second place. Cruse eventually got by, but couldn’t run down Kelly in the final laps. Cruse held off Bigley in a photo finish for second. Scott McKay and Cody McDuffie rounded out the top five. Kelly and Cruse were both later disqualified after they failed postrace technical inspection, which gave the win to Bigley. 25-lap Bomber feature; Rachelle Rudolph won the 25-lap Pep Boys Speed Shop Modified Mini feature; and Jeff Firestine finished the night by winning the 25-lap Take Aim Gun Range Street Stock feature. Next week at Desoto Speedway, the Bombers take center stage for the 100-lap Florida State Bomber Championship. School Bus Figure 8’s and Desoto Enduro classes will also be in action. 13. 50 Dave Blanchard D.N.S. 6. 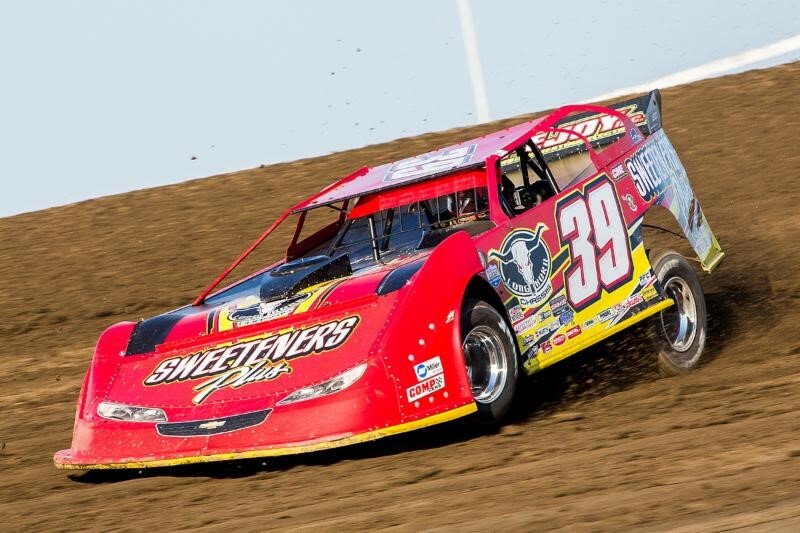 28 Billy Bigley Jr.
7. 5 Larry Welter Jr.
12. 10 Tristan Collins D.N.S. 13. 14 Adam Briggs D.N.S.